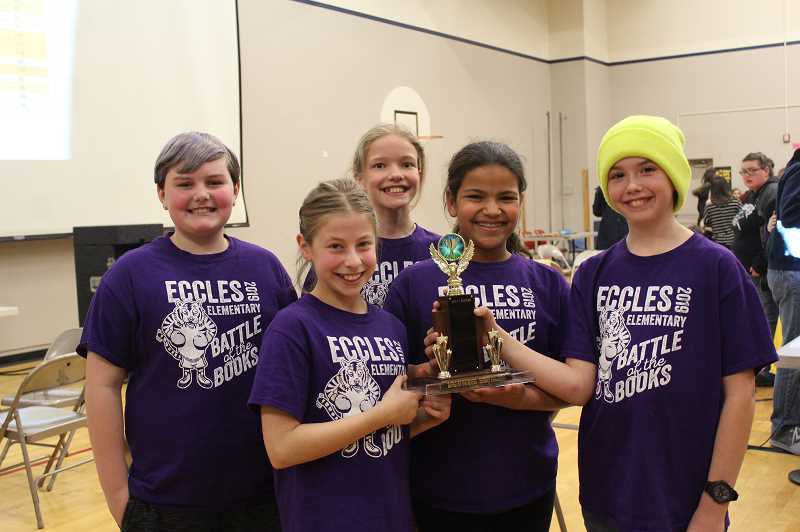 Star readers from Canby's elementary schools participated in the district Oregon Battle of the Books tournaments last week, but only one team from each age group could take home the win. Families and friends came out to watch the 6th-8th grade tournament on Tuesday, Feb. 19 at Ackerman Center (consisting only of 6th grade teams due to lack of interest and leadership at Baker Prairie Middle School) and the 3rd-5th grade tournament on Friday, Feb. 22 at Eccles Elementary. "I really like how so many parents and grandparents take time to come watch the battles and support their kids; and I love how the academic kids get to compete in such a serious tournament through OBOB," said volunteer Tracie Heidt. "It's really important for schools to celebrate literary achievement like this." At Canby's 6th-8th grade tournament, it was the "Book Memorizers" from Ninety-One School who came out on top. 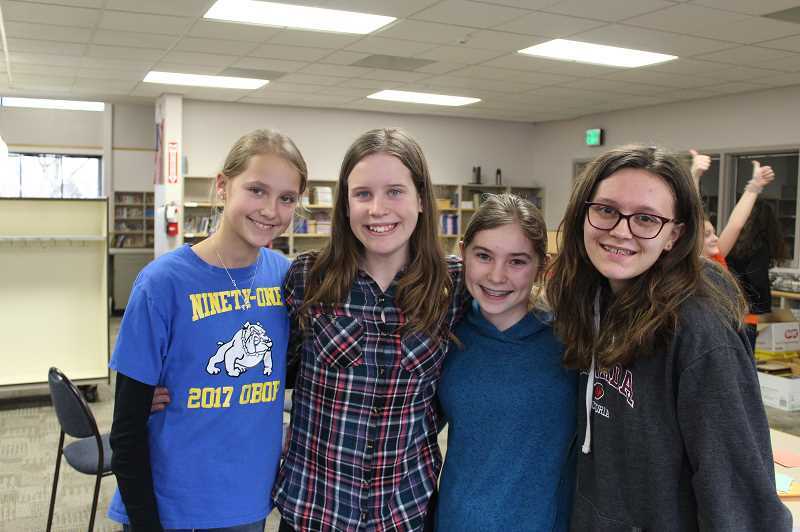 Team members Jolie Rodolph, Audrey Burke, Hailey Magenheimer and Olyvia Gilmore described their strategy: they divided up the books from the list so that each team member read four of them as many times as possible, and they depended on each other for answers during the contest. The girls could hardly contain their excitement about winning. "It feels really good and exciting," Burke said. At the 3rd-5th grade tournament, the "Traumatized Turtles" from Eccles Elementary came away with the trophy. The team members are Harley Baxter, Hayden Wojack, Nona Chernishov, Sadye Taylor and Brendan Snyder. OBOB is a statewide program for students in grades 3-12, with a mission "to encourage and recognize students who enjoy reading, to broaden reading interests, to increase reading comprehension, promote academic excellence and to promote cooperative learning and teamwork among students," according to OBOB's website. This year, the statewide list comprised 16 books for both the 6th-8th grade level and the 3rd-5th grade level. Students who wanted to participate read the books, which span a variety of genres and reading levels, and studied to be able to answer questions about the books at the tournaments. 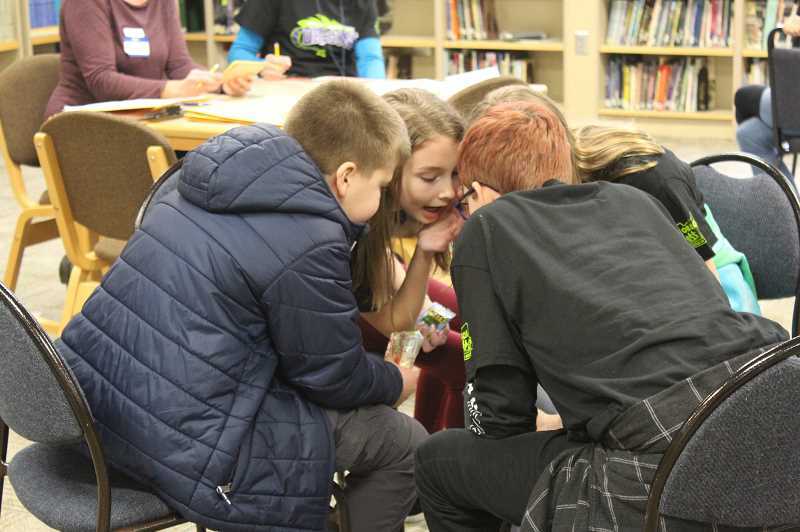 While the Book Memorizers and the Traumatized Turtles boast district titles, actually each school in the district can take a team from each age group to the regional tournament, which happens on March 9.